In what could be considered a foregone conclusion, the Sacramento Local Agency Formation Commission (LAFCO) decided last night not to reconsider their February 7 decision to allow a sphere of influence application to proceed. The vote was 5-2. That decision allows the private property owners to proceed with their plans to turn 1,156-acres on the southern border of Elk Grove into a large-scale residential development. Numerous parties have opposed the move saying it is not only eliminating valuable agricultural land and wildlife habitat, its location outside the Sacramento County's urban services boundary is enabling further suburban sprawl. The reconsideration of the February decision was allowed after new information regarding the application was made available after that meeting. The hearing was first scheduled to be held on April 4 but was rescheduled because of safety concerns about nearby protests at the Sacramento District Attorney's office on G street in downtown Sacramento. In his presentation to the commission, LAFCO executive director Don Lockhart said the reconsideration was based on two letters they received within 30 days of the February hearing asserting it should be reconsidered based on new information. The points of consideration were the availability of water and South Sacramento Habitat Conservation Plan for the proposed two-square-mile housing development. Lockhart immediately shut the door on the matter saying LAFCO staff recommends against the action. "Our recommendation is you deny the request for consideration largely based on the rationale that the points raised were already addressed," he said. He also said issues like determining a water supply for the housing development would have to be identified when the annexation of the property in the sphere of influence application area initiated. Lockhart also noted the approval of the private parties request does not mean the area will immediately develop. 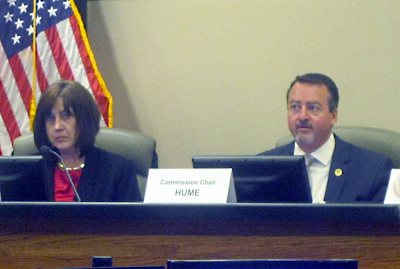 Elk Grove City Council Member and LAFCO Chair Pat Hume instructed speakers during public comment to narrowly focus comment on the reconsideration items only, and not to discuss other aspects of the controversy. "The issue at hand is that request for reconsideration, so, therefore, comments should more or less directed at 'why this is the whole thing ought to be be opened back up and not necessarily the merits or demerits of the application itself," Hume asked Lockhart. Lockhart added, "or the vote itself." "If you could limit to the issue at hand, and not the opinions on the actual application itself we would appreciate that," Hume added moments later. While some of the 12 speakers discussed aspects for the reconsideration, many ignored Hume's instructions and criticized the decision, and the workings of LAFCO. "Your staff has recommended that reconsideration be rejected by an exceedingly narrow interpretation of reasonable reasons," Andy Sawyer chapter chair for the Sierra Club Mother Lode Chapter said. "We believe we have met that very narrow interpretation. The staff's interpretation defeats the whole purpose of having a reconsideration process." During their deliberation, some of the commissioners expressed a sense of frustration with Lockhart after his unwillingness to provide clarity in his responses as to whether or not there was anything in the requests that warranted reconsideration. Seeking the information from Lockhart were commissioners Gay Jones, Angelique Ashby, and Jack Harrison. Several minutes after providing a rambling answer to a question from Harrison on his opinion if the matter should be reconsidered and not seemingly answering the question, Ashby tried to re-frame the inquiry. Ashby asked Lockhart and legal counsel, Nancy Miller if there was anything that would change their recommendations, not on the application itself, but on the recommendation to reconsider. After another lengthy response that did not answer Ashby's question, Harrison asked Lockhart for a direct response to his question. Lockhart said, "that would be a no."